When the final stats are recorded, whether or not the Colorado Rockies make the playoffs, Carlos Gonzalez will have turned in a very respectable season. Not his best. Not his worst. Certainly worth the $8 million Jeff Bridich decided to fork over late in free agency, March 9 to be exact. Compared to last season – when plenty of people (including the Colorado Rockies) nearly wrote him off – Gonzalez has been nothing short of stellar. At the age of 31 last season, he struggled for most of the season but managed to finish respectably. Maybe that’s why Bridich ultimately decided to bring him back, but whatever the reason, Gonzalez has justified that decision exponentially. With 38 games still to play, Gonzalez has almost surpassed last season’s RBI total (57 total in 2017; 52 this season), has hit the same number of home runs he did last summer (14) and his batting average is 26 points higher than in 2017 (.262 compared to his current .288). And yesterday, in the top of the ninth with the Rockies up one run and a chance to sweep the Braves in Atlanta for the first time in franchise history on the line (not to mention a chance to return home from a crucial road trip at 5-1), and Gonzalez on deck, Gerardo Parra was thrown out trying to go first-to-third on a Ryan McMahon single. With only one out, Parra’s attempt wasn’t a bad decision – the thinking was probably that if anyone was capable of hitting a sacrifice fly to extend the lead to 4-2, it was Gonzalez – it just didn’t work out. So, with McMahon on second and two outs, Gonzalez strolled to the plate. Three pitches later, he was down in the count 1-2. Another ball. Another foul ball, and Gonzalez remained at the plate with a 2-2 count. With the sixth pitch, he slapped the ball the center; it was a professional at-bat that scored a run that would later prove to be key. The final score read 4-2. But in the bottom of the ninth, Rockies closer Wade Davis faced just enough traffic to make things interesting. The last out came with a runner on second (a runner that might have provided the game-tying run had Gonzalez not come through with his top-of-the-ninth RBI). 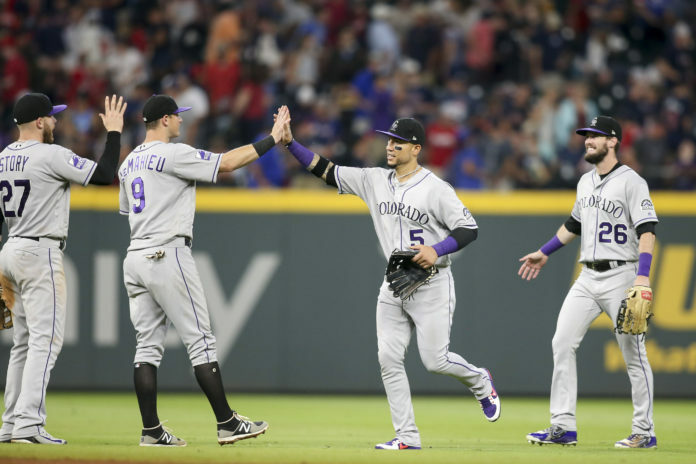 The fourth run, and the at bat that produced it, will likely never show up in the history book that describes the 2018 Colorado Rockies – a resilient team if there ever was one. But that run does highlight the importance of Gonzalez. There was a time that Gonzalez and his sweet, swooping lefty swing might not have taken the same approach. 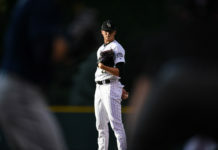 There were times in his career he might have tried to hit one out – which he can still do with ease – knowing well that the Rockies already had the lead. But these days, Gonzalez is the ultimate team player. It should be noted, too, that the at-bat was a pinch-hitting assignment, as Gonzalez had been given the day off. Gonzalez has always been a great teammate (ask anyone who’s ever played alongside him). But this feels different. This season, he’s playing like a veteran, a leader, a guy who has his sights set on the postseason. This offseason, there was much more to signing Gonzalez than his cannon of an arm or his career .288 batting average. Sure, there was some sentimental value to bringing back one of the most-storied players in franchise history (a solid statement to players who witnessed an organization taking care of one of its own), but Bridich inked a player who is going to make a real difference on a playoff team. That’s right, a playoff team. The 2018 Colorado Rockies are a resilient bunch, and if the past week is any reflection, they’ll somehow find their way to the postseason for the second year in a row. And while most will point to the obvious reasons – Nolan Arenado, Charlie Blackmon, Trevor Story, D.J. 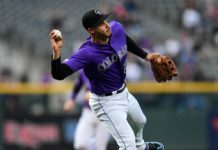 LeMahieu, Bud Black – they’d be remiss not to think of Carlos Gonzalez. The most important signing of the offseason, and a player who should finish his career in Colorado purple.